Somewhere to call home – the Battle for Princes Park. In 1878, the Carlton Football Club was given assent by the Council for the “permissive occupation” of 6 acres of the Princes Park which expanded to 13 acres in the football season (passed by two votes) They were apparently also granted granted permission to erect temporary “hurdles” or fences in a part of the Princes Park where it had until that point been a cow paddock. The Argus reported on August 20, 1878 that some Councillors had asked that this permission be rescinded, but that in lieu a portion of the land in the Park should be leveled and fenced off to prevent intrusion by cows, and “allow the playing of athletic games”. The motion was eventually granted, and the permission was removed. In 1879, The Australian Town and Country Journal referred to the new ground as Princes Park and stated that attendance at the new ground was rather large. In 1883, Carlton declared its intent to build a clubroom at Princes Park “in order to bring the players together for regular practice and training”. This was apparently meant to be a portable building, which along with the fences would be taken down at the end of each season. The fences further had to be removed at the end of each days play. This agreement lasted until 1889. In 1887, the Argus noted that staff at the Cemetery had locked the gates leading into Princes Park due to the noisy football crowds that tramped through it to the Princes Oval. This would reportedly inconvenience 5,000 – 6,000 attendees at matches. In September 1890, the Council was again called up to vote on the matter of creating a Public Recreation Ground at Princes Park with one Councillor pointing out that various attempts had been made to establish such for over 20 years. With permissive occupancy being eventually granted by the minister of lands, the Clubs began to construct infrastructure – namely permanent fencing. However the Council attempted to prevent this, and when it failed, elected to take court action. The Council objected to the fencing in of the Ground on the basis that “the council considers such a concession would be a limitation and restriction of the use of the park by the public, for whose benefit it has been reserved“. Advising the Minister in writing on several occasions that the Council could not approve of the new arrangement. On September 4th, 1890, The Argus reported that the council had taken the Board of Lands and Works to the Supreme Court stating that the Board were joint trustees and unable to make unilateral decisions regarding the park. The Minster of Lands would not withdraw the permission at the time. When the case came to court, the Board of Lands withdrew from the case after its advisors said it had no case. In March 1891, The Argus opined that the Councils fears concerning the public access to the park were well founded in light of the fact that “9/10 permissive tenancies” had resulted in defacto ownership of the premises. This included the Melbourne, Richmond and East Melbourne clubs as well as Scotch College. Noting that an attempt to secure Fawkner Park the same way had been recently foiled, the Argus hoped that the council would see Princes Park done properly to prevent the “wholesale robbery of the public estate”. In September 1895, the question came before Council again, with it being pointed out that where some clubs had been able to enclose the ground, they had considerably bettered it. (The Melbourne Bowling club was held as an example). The Council at this time favoured the “alienation” of the ground whereby the clubs would pay an annual rent, but would at no stage receive ownership. The Leader wrote that the new site was “practically a wilderness. In fact it had long been a rubbish tip…in one corner there was a water hole in which the local dogs were trained in aquatic exercises”. Management of the ground was eventually handed to the Carlton Recreation Ground Committee, consisting of 3 board members from each of the Football and Cricket clubs, and a rotating chairman. The Chairman would eventually be made independent after the falling out in 1908. By July, 1897 the Launceston Examiner reported “that the long fought for Princes Park has been granted to the Carlton football and cricket clubs”. The Examiner stated that Princes Park “will be a fine place when suitable buildings are erected, but at present football is played there under difficulties”. In 1907, Council debated a move to have a railway platform built at the back of the Carlton Oval reopening the East Brunswick line for football and cricket fans. The First match at the new Carlton Recreation Ground was held on the 22nd of June 1907, Queen Victoria Jubilee Day, featuring Carlton and Collingwood. The Argus reported in 1907 that the Carlton Recreation Ground had been the scene of many famous football matches but had no spectator accommodations stating that “the old pavillion is much behind the times and teams using it have often complained about the lack of comfort”. The Argus said that for some years proposals had come and gone to build a new grandstand, but had been hampered by financial problems. However, the Argus also reported that the Carlton president had recieved an offer to underwrite the cost of a new stand, estimated to seat about 800 people and cost about 2000 pounds. However despite this offer, infighting between the Carlton Football and Cricket clubs was at least partially responsible for the delay of the structure being built. (In fact it got so bad that it required a special conference with a government mediator) However, by December 1908, The Argus reported that the Committee was agreed that a new grandstand was required. Construction of the 3,800 pound grandstand would commence in March 1909, with the aim of seating around 2,000 people. The Gardiner stand would take 3 months to build, consisting primarily of wrought iron. It was formally opened before a match against Essendon on June 21, 1909. In 1910, The Argus reported that some in the council were concerned that the Carlton clubs were only paying 1 pound a year in rent, while not contributing anything to the maintenance of Princes Park. It was proposed that the rent be raised to 150 pounds in 1911. It was also proposed to raise Richmonds rent to 75 pounds. In 1918, the Leader reported that the Carlton ground was larger than even the MCC enclosure (the Melbourne Cricket Ground) and had greater potential. The Gardiner stand was referred to as “lofty, graceful and capable of indefinite expansion”. The Ground apparently also had a large embankment with a capacity for 50,000 people. In 1923, the Argus reported that the erection of another brick retaining wall will assist in the construction of the graded embankment bringing the grounds capacity to 100,000 spectators at the Recreation Ground. In November 1929, the Argus reported that proposals were being considered for the construction of another Grandstand at the Carlton Recreation Ground. This would eventually result in the construction of the Robert Heatley Stand on May 7th, 1932. In September 1944, an audit of the ground found that the official capacity of the Carlton recreation ground sat at 62,300 including members reserves of 22,620 (in comparison St Kilda’s ground held 58,744). Princes Park was used for the VFL finals in 1945, while the MCG was occupied by the military. The Grand Final crowd was reported at 62,986. In 1952, The Argus reported that the VFL was concerned over the size of crowds that the MCG could hold, as it anticipated crowds of up to 120,000 which were not then possible at the MCG due to health department. It was then under consideration that not only could finals be moved to the Princes Park but so could the leagues administration offices. As reported in the West Australian, This coincided with announcements of a world wide competition for stadium designs for an Olympic stadium expected to be built at the Carlton ground for the 1956 Olympic games. The stadium was anticipated to hold 125,000, with 50,000 seated and another 30,000 undercover. Astonishingly, the competition was only given 3 weeks to run. The Olympic stadium was later built at the Melbourne Cricket Ground. In 1954, Carlton attempted to persuade the VFL to hold the finals again at Princes Park, pointing out that the ground could accommodate more paying customers. The VFL refused saying that the next 3 finals series were bound to the MCG by contract. The 1970s saw the construction of the Hawthorn, now Pratt Stand, and the 1980s the construction of the Elliot, now Heroes Stand.These served to remove standing room and move towards the goal of encircling the whole ground with stands. Right from the outset, any ground improvements raised the ire of residents being most concerned about the plans for underground parking and floodlights, to the point that it was being called Albert Park Mark II by the Princes Park Protection Association. The planned expansion from 32,000 to 45,000 was abandoned, instead settling at 35,000. The Legends Stand opened in 1997, but even before it was completed the future of Princes Park as an AFL venue was under threat from a new menace, the Docklands precinct. Not only would Princes Park have to compete with the MCG, its much anticipated position as number 2 was under threat from a new corner. Carlton blamed the AFL for the negative connotations involved with Princes Park at this time, and the media eventually resorted to playing this off John Elliot v Sandra Hart (the Save Princes Park leader). Polls of the time showed that Princes Park was not though of fondly. In 2007, The Australian reported that Graham Smorgon had proposed a massive redevelopment of the Carlton Recreation Ground. The upgrades were estimated to cost $67 million and involved demolishing all grand stands bar the Heroes Stand and making them into Plazas. The whole plan was condemned when Smorgon lost his election to Richard Pratt in 2007. The Harris and Heatley Stands were torn down in 2007-2008 to make way for new facilities at Princes Park in an $18 million redevelopment funded by the State (4.3million), City of Melbourne (2million) and the AFL (3.45 million). Visy naming rights worth $5 million over 3 years were also contributed. Amongst the facilities were included a new gymnasium, altitude room, and hydro facilities. 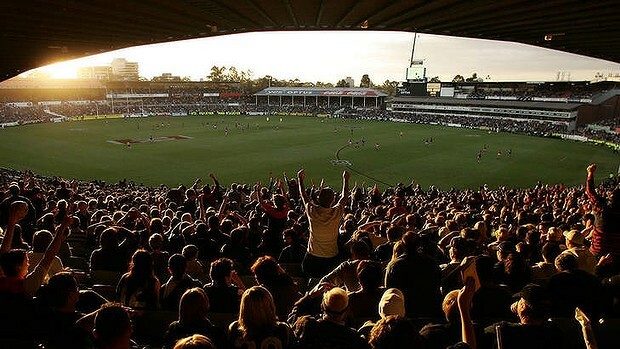 The AFL has on several occasions talked about using Princes Park as a third stadium for minor matches, even though most believe that its a ploy to use against the MCG and Docklands to get better deals. The possibility of a return emerged in 2009 when the The Age reported that AFL was negotiating for better deals with its major stadiums and the AFL confirmed it was going ahead with a feasibility study. The AFL was reported by the Age in March 2013 to have started running assessments on the Parks viability for AFL matches just 18 months ago. However while the stadium can back favourable in cost terms, it didnt have a lot to go for it when it came to transport. In march 2017, The Age reported that Carlton and AFL officials are discussing a proposal that will help Carlton make significant changes to Ikon Park, including installing new change rooms and re-laying the surface. The Carlton football clubs 2015 Annual Report stated that the Board had initiated a review of Ikon Park and in 2016 the club would be releasing an exciting master plan that will ensure its future. “The Princes Park precinct will forever be in our DNA“. In February 2016, The Age reported that the primary focus of Carlton’s master plan for Princes Park wasn’t restoring it as a home-and-away venue, rather it’s what the precinct as a whole would look like. The article said that while the Blues were open to the ground hosting AFL matches, it was more likely that the ground would be an elite training facility for its womens side, amongst others – AFL Victoria, AFL umpires and the AFL Victoria women’s academy are already based at Ikon Park. Carlton CEO Steven Trigg is remaining realistic, saying there are some key hurdles the Blues would need to overcome. On March 30, 2016, AFL.com.au reported that Carlton hoped that Princes Park would become the new home of the fledgling AFLW competition. Carlton CEO Stephen Trigg said the ground at Ikon Park would not need much of an upgrade to host women’s games, with any redevelopment to focus on the venue’s grandstands and changerooms. In terms of it again being a fully fledged AFL venue, the message from the Blues was “never say never”. Trigg said the Blues were “open” to reactivating the ground but he would not speculate on what an upgrade would cost. Industry speculation was that it would cost more than $100 million. Asked whether Carlton would consider championing Ikon Park as an alternative AFL venue, Trigg said the Blues were “not absolutely bashing the door down for that to happen” given the AFL had given no indication it would fixture games there. On February 5, 2017, the Heraldsun reported that Carlton will “never say never” about returning home games to Ikon Park because of the ground’s phenomenal pulling power, but the Blues said the AFL had made it known its priority was to revamp Etihad Stadium rather than invest in a boutique stadium. Carlton chief executive Steven Trigg said the retention of the venue’s stands and sense of history was one of his priorities. Trigg said Carlton fans had to realise it was the AFL that made the scheduling decisions on venues. On February 27th, 2017, The Age reported that the “overwhelming success” of AFLW at the ground had caused the AFL to consider fast tracking plans to upgrade parts of Princes Park into a more modern facility capable of hosting AFLW matches, AFL preseason matches, and even possible AFL season matches. The Age reported that the AFL and State Government were likely to chip in for the proposal which would be likely to include new change rooms, resurfacing and permanent lighting. In October 2017, The Age reported that the State Government was still considering proposals, and that the Blues had held talks on the development at State and Federal levels. A decision was expected by the end of the year. “That [AFLW] is also a matter for the AFL. Ikon Park is pretty good but that’s up for discussion. There are some various ideas about where all that should be. Maybe it’s a couple of grounds that will accommodate [AFLW],” Sports Minister John Eren said. the Pratt Stand would be knocked down. The 109-year-old Gardiner Stand would be preserved given its heritage listing and historical significance. Ikon Park would house facilities for the AFLW and VFLW teams and allied health facilities. The 21-year-old Legends Stand would remain to ensure the ground was ideal for AFLW and JLT games. Carlton chief executive Cain Liddle told the Herald Sun that the Blues had ambitious plans. On April 12, 2018 the State Government announced $20m in funding for Princes Park to develop womens facilities. The Blues revealed that as part of the Masterplan, the Club intends to demolish facilities in the south-west corner of Ikon Park to make way for additional elite facilities, including an education hub and administration area to cater for the expansion and growth of female football and the broader Carlton Football Club. Since 1921, more than 21 million people have attended games at Princes Park with 1066 games played there at an average of 20,500. It has hosted 496,000 people during 13 finals matches at an average of more than 38,000. The last AFL match was played at the stadium in 2005, although the league still uses it for preseason games, and the VFL (state league competition) Northern Blues still use it competitively. In 1994, Carlton became the first AFL club to sell out the naming rights to its home ground. It wouldnt be the last. The Western Bulldogs and South Melbourne both had very short stints at Princes Park due to the second world war. Fitzroy played home matches at Princes Park from 1957 to 1969. In 1974, Hawthorn began playing home matches at Princes Park. This would last until 1991 when Hawthorn would move to Waverly Park. Fitzroy returned in 1987, and lasted un 1993 before moving to the Western Oval. It was the home of the Carlton Soccer Club during its short lived stint in the National Soccer League, as well as being a temporary home to the Melbourne Storm NRL Club. It is currently home to the Melbourne Rebels Super 14 team.